Sara Farizan was born on August 2, 1984 in Massachusetts. Her parents immigrated from Iran in the seventies, her father a surgeon and her mother a homemaker. Sara grew up feeling different in her private high school not only because of her ethnicity but also because of her liking girls romantically, her lack of excitement in science and math, and her love of writing plays and short stories. So she came out of the closet in college, realized math and science weren’t so bad (but not for her), and decided she wanted to be a writer. She is an MFA graduate of Lesley University and holds a BA in film and media studies from American University. Sara has been a Hollywood intern, a waitress, a comic book/record store employee, an art magazine blogger, a marketing temp, and an after-school teacher, but above all else she has always been a writer. Sara lives near Boston, has a cool sister, loves Kurosawa films, eighties R&B, and graphic novels, and thinks all kids are awesome. 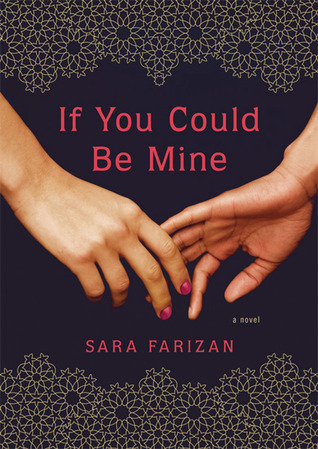 If You Could Be Mine is Farizan’s first novel. It is about two girls (Nasrin and Sahar) who are lesbians in Iran. They story is written through Sahar’s perspective. They could be killed for their relationship, but Sahar is so in love with Nasrin that she is desperate to find a way they can be together forever, publicly. When Nasrin gets engaged, the pressure is on for Sahar to find a solution to their problem. If You Could Be Mine looks into a big issue that Iran has because of its harsh stance against homosexuality. It describes the ways that homosexuals can be together, drugs, illegal TV and music, as well as being transsexual in Iran. I thought the story was good and seeing problems that other cultures deal with was eye opening. I think it is so important, especially for younger readers, to be introduced to other places and their customs. I actually learned a lot from reading this book even though it was a teen fiction. However, I was not a huge fan of the voice in the story. It is written very simply almost as if the writer doesn’t speak English very well. I can see why she would write it like that because Sahar doesn’t speak English, but these are her thoughts, so she shouldn’t speak that way in her head. By the end, I was invested in their story. Nasrin is such a spoiled brat and she doesn’t deserve Sahar’s love. It is painful to see the lengths that Sahar is willing to go to for Nasrin when Nasrin would do nothing for Sahar. If You Could Be Mine was a fast read with a great ending. You need to examine some mla style guides written by advanced educators not to fail while writing your own essay.